Writing a resume can be a daunting task for many people. It’s probably one of the most important documents you’ll have throughout your life, yet I’m still surprised at how many people have not figured out how to write one. With the wide array of resources and templates available online today, there’s no reason you shouldn’t have a great resume. However, there are some grey area items that many people are still unsure about. Here are some of those things you can exclude from your resume the next time you are on a job hunt! No one needs to see what you look like when applying for a job, unless of course you’re applying for a modeling job or are an actor or performer. Even if it’s part of your resume design, remove the photo of yourself, especially if it’s not a professional one. People aren’t hiring based off looks and they will eventually meet you in person any way. In fact, every time I’ve ever read a resume with a photo on it, it just made me feel uncomfortable, like their looks somehow would contribute to how good they would be at the job. So just remove it! Unless your hobbies are somewhat related to the field or job you are applying in, they don’t need to be included on your resume. When you’re young, and looking for your first part-time job in high school this can add value given you’ve probably never worked or volunteered before, but beyond that you can remove these. An example of a related hobby however could be if you are applying to a travel company and you have a travel blog, or are applying to work at a ballet/dance company and you grew up competitively dancing. However, often times this can be outlined in your cover letter versus your resume. As soon as you start to gather relevant work experience, you can start to delete all the irrelevant work experience. For example, if you’ve been working in the industry for three years, no one is going to care that you worked at McDonald’s ten years ago. Also, when you’re new in the industry there is no reason your resume should be multiple pages long (I’ve been working for five years and my resume just this year expanded to 1.5 pages). 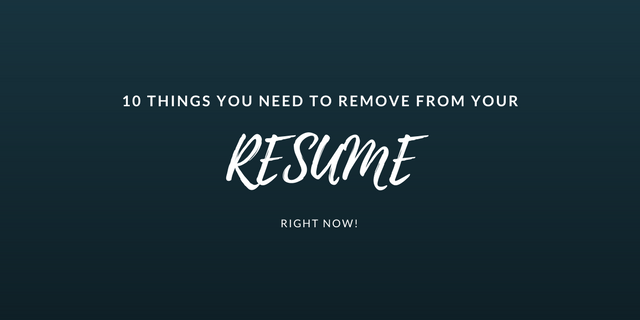 So even though you may want to hold onto some of your irrelevant work experience to make your resume look full, it’s just fluff and an unnecessary filler. No one wants to reads a novel when they look at your resume. Break up your text with bullet points and subheads and cut out the lengthy descriptions of things. Instead, break it down into more digestible, bite-size pieces of information. Employers get hundreds of resumes for positions and they need to be able to quickly scan over your resume to determine if you’re the right fit, the minute they see three pages of word vomit they won’t even bother to stop and read it! So stick to the point. I’m all for creative resumes. I love something that is more than just the basic Microsoft Word template and that stands out from the bunch. However, sometimes people get a little TOO crazy with their resume and it’s hard to read or difficult to dissect their actual experience. For example, I recently looked at a resume that included a bunch of pie graphs and charts to explain their skills and what they did, however, it just made me sit there with a puzzled look on my face as I tried to figure out what they were trying to tell me. Stick with clean, modern designs that look pretty but also are still easy to read! Especially since you don’t know how old or traditional the recruiter may be. If an employer needs references they’ll ask for them when you apply or when you’re in the interviewing process. They likely won’t be calling these people before they meet with you any way so including the details of your references or “references available upon request” is just a waste of space. Most of the time these are super generic statements at the top of your resume like: “Marketing professional seeking new opportunities in the social media marketing space.” Likely if you’re applying for the job the employer already knows your objective, you’re interested in the job and would like to land an interview, therefore this is just another waste of space. If you still feel you need some sort of intro on your resume it’s more valuable to include a quick elevator pitch of yourself but don’t just regurgitate what’s already in your resume or cover letter! I get it, you may want to hold onto your old email address that you made in grade ten because it’s sentimental, keep it but create something else for your resume and applying for jobs. It doesn’t look very professional (or mature) when your email address is something like: babygirl_x0x@hotmail.com versus something simple like your name. This is pretty straight forward. Proof your resume and get someone else to look it over too! Don’t ever assume that the person reading your resume will understand the acronyms or company or industry specific jargon you use. You never know who will read your resume and you want to make it understandable to anyone on the other end of the hiring progress. Spell out acronyms and make sure you are referring to anything that is company specific to your current/previous workplaces that external people wouldn’t understand. Creative Resumes – Standing Out in a Competitive Industry Why Job Hunting is SO Frustrating Why It’s Okay to Turn Down a Job Offer Welcome to the real world. What they don’t teach you in school!